I’ve made choux paste so many times. In fact, I think I have more choux paste recipes than I have cake recipes. It’s probably because of how delicate and wonderful choux is. It’s slightly crispy on the outside but melts in your mouth as soon as you take a bite. 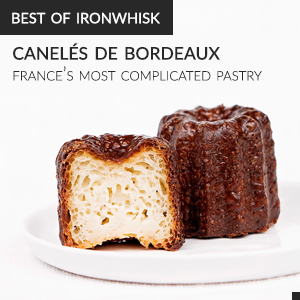 Whether you make churros with your choux paste, éclairs, or something else delectable, it’s guaranteed to be delectable. Since if you’re making something delectable, it has to be delectable to be delectable, if you catch my drift. It’s also because the golden rule of baking is that if it’s made with choux it’s made with awesome. Yeah, the golden rule of baking is much better than the golden rule of life – you know, the one that says do onto others as you’d like them to do onto you. This one involves choux paste after all. Choux paste is pretty easy to make but it can look really impressive. It’s essentially just boiling water with some butter, stirring in flour, and then beating in a few eggs. The real magic of choux is in the oven, where it expands from tiny dollops of an off-white paste to large puffs of perfection. 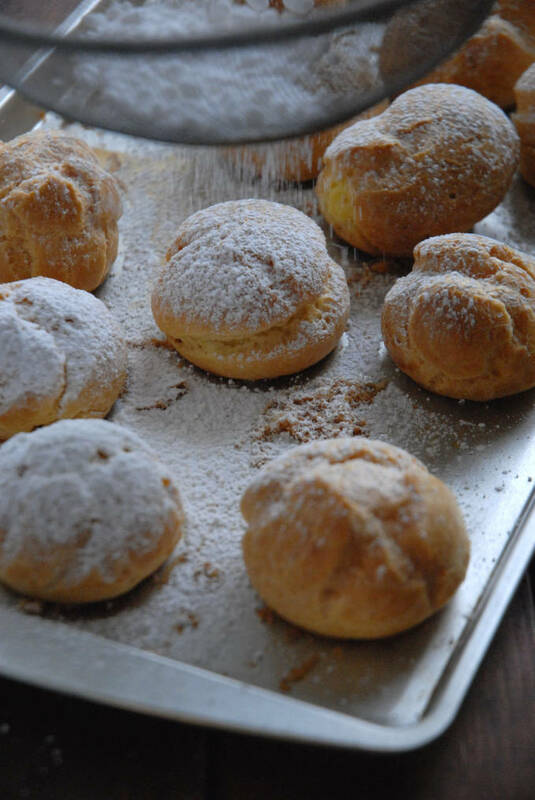 That puffing up results in a slightly crispy exterior but a completely hollow interior that’s perfect for filling up with pastry cream, the traditional choux accompaniment. I made these profiteroles (French for cream puffs) two ways. I dipped some of them in caramel and I sprinkled the rest with icing sugar. I’m not really pleased with how the caramel ones turned out so I don’t want to share that recipe with you just yet. 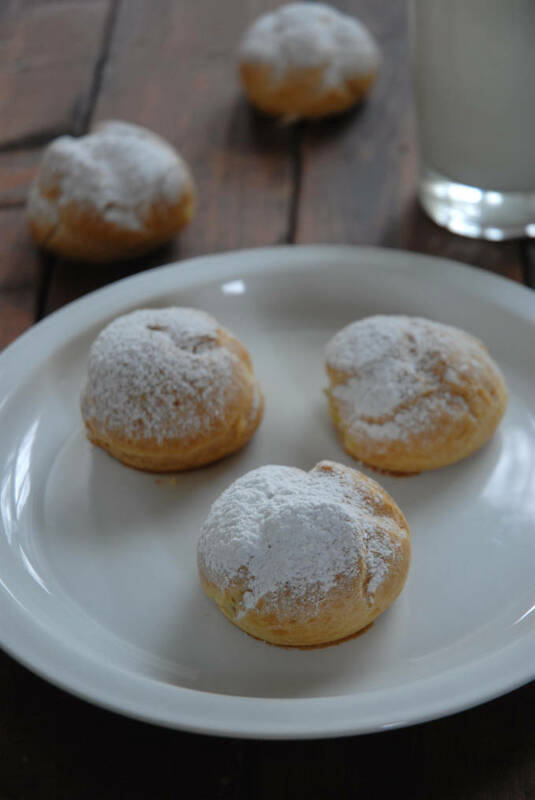 The ones sprinkled with icing sugar are much quicker to make anyway and taste amazing! I think I scarfed down four today. Considering there were only four left today, that’s saying a lot. If you’d rather not sprinkle icing sugar on them you can also enjoy them dipped in melted chocolate. I suggest tempering your chocolate before dipping them, however. If you don’t temper your chocolate it won’t crack properly when bitten into and that’s just not appropriate for such an amazing dessert. Only tempered chocolate for amazing desserts! That’s baking rule number two. See that strangely shaped profiterole in the above photo? Yeah, it was delicious too. It doesn’t really matter if you don’t pipe your choux paste exactly the same for each one. They all taste great and every “mistake” means one you must “dispose of”. I wish that’s how it worked in real life. You make a mistake, you get a profiterole. Unfortunately, in real life, it’s more like you make a mistake you don’t get a profiterole and then someone comes up and kicks you. Oh, and then really disposes of you. There’s a very specific reason why I chose to make profiteroles this week other than to, well, eat them. Eating them was important, yes, but this reason was more important. Or maybe equally important. It’s hard to compare the two since profiteroles just taste so good. Anyway, you’ll have to wait until next week to find out why I made these. Ooo.. cliffhanger. 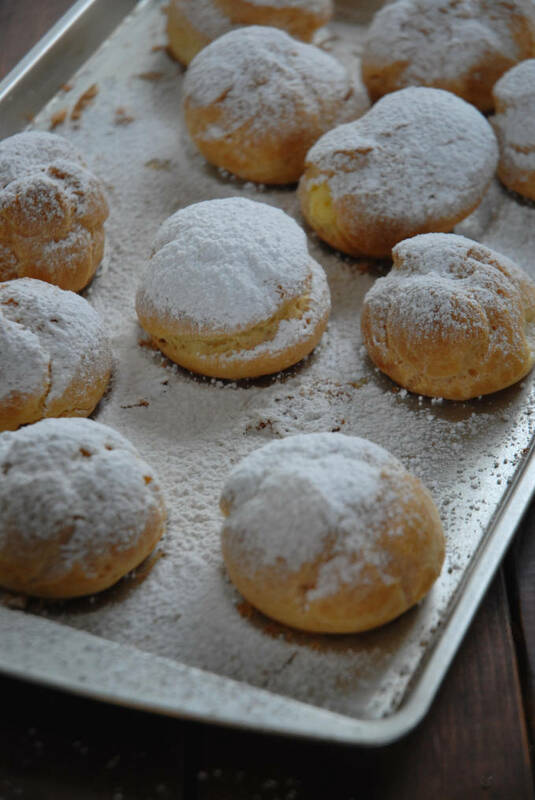 Profiteroles (cream puffs) are made with choux paste and then filled with vanilla pastry cream. In a bowl sift together the flour, sugar and salt. Set aside. Place the butter and water in a heavy saucepan over medium heat and bring to a boil. Remove from heat and, with a wooden spoon or spatula, quickly add the flour mixture. Return to heat and stir constantly until the dough comes away from the sides of the pan and forms a thick smooth ball. Transfer the dough to your electric mixer, or with a hand mixer, and beat on low speed a minute or two to release the steam from the dough. Once the dough is lukewarm start adding the lightly beaten eggs and continue to mix until you have a smooth thick paste. Using a piping bag with a round tip, pipe the smooth dough into balls onto a baking pan lined with parchment paper. Bake at 400°F for 15 minutes and then at 350°F for about 30 minutes, or until golden brown on the outside but hollow on the inside. Leave the oven open a crack (by using a spoon or something else to hold it open) and let cool completely. Whisk together the egg yolks and sugar together until they are a pale yellow. Sift together the flour and cornstarch and then whisk them into the egg yolk mixture until you get a smooth paste. Meanwhile, bring the milk and vanilla to a simmer (small bubbles) in a saucepan over medium heat. Remove from the heat and add slowly to the egg mixture, one drop at a time and then in a steady stream, constantly whisking. Then, pour the mixture back into the saucepan and cook over medium heat until very thick, stirring constantly. Pass through a sieve if your eggs curdled (if there are pieces of egg in your pastry cream). Let cool in the fridge for a few hours. Using a piping bag pipe the pastry cream into a hole in the profiterole. If there are no holes, use a wooden skewer to create one. Alternatively, cut them in half and fill with two teaspoons. You can also serve them with vanilla ice cream and chocolate sauce. Gorgeous. And I couldn’t agree more. I use this dough all the time…and to such rave reviews! Thank you for sharing such a sweet recipe. A lovely way to begin the work week! I hope yours is full of good food, friends, and laughter! Do you deliver? These look fab! But, just yesterday I was dreaming about eclairesand other profiteroles… Can your read my mind??? you are very talented with pastry creations. I need lessons from you my dear! This is John’s favorite dessert. I know I can get a smile if I serve this after any meal. Yours look so good! Ooo I love cliffhangers!! haha. this looks yummy! These do look impressive. I would be very happy if someone served this dessert to me. I bet they are scrumptious! Profiteroles in France are always filled with vanilla ice cream and covered with warm chocolate sauce. Pure heaven! Hi. These look really professional, however whenever I make them, they never turn our completely round. Yes they rise and puff up and don’t sink when cooled, but they don’t keep their round piped shape. Do you have any advice? I use a round tip, but maybe it’s a bit too big? Any help would be greatly appreciated. Hi! I’ve read your Eclair tutorial and I’ve noticed that you mentioned to use Bread Flour, whereas for this recipe, you’ve just used AP flour. 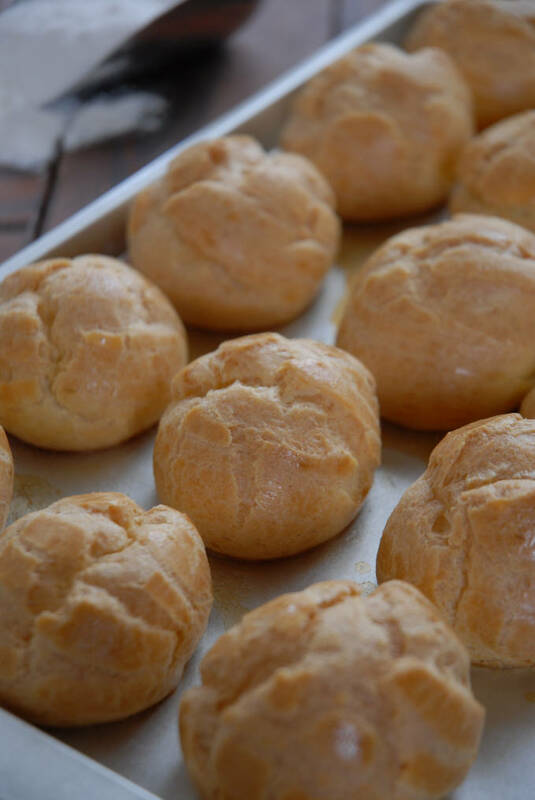 Is it necessary to use bread flour for profiteroles? I made some nice Eclairs from the eclair post (Although Some eclars were hollow and some weren’t.. appreciate if you could give me an insight on why this is happening. I Used a 1M Tip), It was really easy to follow and I liked that I did not have to change the oven temp. Could I just use the same method for this?